Franklin-Monroe’s Chloe Brumbaugh is seen above playing a little defense in a game last year. This season, the junior feels fully recovered from an injury she suffered as a freshman and is ready to move back up front on offense for the Jets. PITSBURG – It’s clear from the first time you meet her that Chloe Brumbaugh has a passion for sports. 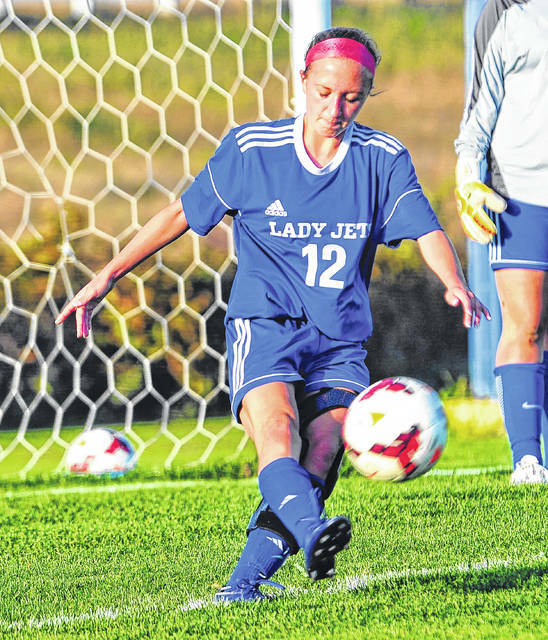 The soon-to-be 17-year-old junior from Franklin-Monroe is a three-sport athlete (soccer, basketball and softball) for the Jets and is ready to step back on the pitch fully recovered from knee surgery this season. She played her sophomore year in soccer with a knee brace, but was limited to a more defensive role instead of playing her normal position up front. And she still scored nine goals on the season. This year, she is excited to be back on the front line and wouldn’t want to be anywhere else. Brumbaugh tore her ACL playing basketball in the second game of her freshman season. She tried to play again the next game, but during tweaked her knee during warm-ups and that was it. She got an MRI and found out it was completely torn. She missed the rest of basketball, all of softball that year and all of the summer activities heading into her sophomore year. She even missed the first few games of the soccer season last year, but credits her coach with pushing her to get back on the field. “Coach (Danny) Dicneau pushes me every single day and never backs down and I love it,” Brumbaugh said. “He keeps me going. Last year when I was coming back from surgery I failed my first test to come back and I was completely down about it. I kind of lost hope for a while, but when two-a-days started I came and just watched, but Danny was on my tail every single day to do my rehab. That’s what got me back really quick. Coach Dicneau said Brumbaugh has the heart of a lioness. “She has come back tremendously,” Dicneau said. “Last year she came back in the fourth game and with her presence we had better results. She scored a lot of key goals for us and I played her on defense and pushed her up occassionally. She would score a goal and come back to play defense and stop the other team. Not single-handedly, but she had a hand in stopping the other team. Brumbaugh has set some personal goals for this season, and has a desire to play soccer at the collegiate level too, though she admits thoughts in that direction are just now becoming more of a priority for her. “I’m going to try to savor this year for sure because I don’t want it to be done,” Brumbaugh said. “I really like this group of girls. We all have a lot of fun and there have been lots of adventures with these people. The Jets struggled in the 2017 season with a 1-10-1 overall record (1-2-1 in the Cross County Conference). Both Brumbaugh and Dicneau think this year will be better. “I ask a lot both mentally and physically on the field from these girls and they have adapted well,” Dicneau said. “Our expectations this year are to do better than last year which shouldn’t be hard to do since we didn’t win that many games last year. The girls progressed throughout the season last year and that’s what you want a team to do. You want them to be a better version of themselves and I think we succeeded in that. We won a tournament game last year too which I don’t think too many people expected us to do. Franklin-Monroe gets its season underway tonight with a home game against Brookville. The girls play at 5:30 p.m. followed by the boys, who will host Botkins at 7:30 p.m. This entry was tagged CCC, Chloe Brumbaugh, Danny Dicneau, Franklin-Monroe Jets, girls soccer. Bookmark the permalink.